The Kenwood Chef Major Titanium KM023 is the ultimate kitchen machine. If love to cook and are experienced in the kitchen, regularly prepare everyday meals but like the challenge of trying elaborate recipes and catering for larger groups of friends and family then the Titanium is the machine for you. The Titanium will help to advance your culinary skills with confidence that the machine will achieve the results that you desire. Owning the Kenwood Titanium is like having a second pair of hands in the kitchen. The additional attachments effectively give you a complete set of food processing equipment in with one machine. The Titanium is an excellent purchase for any serious cook. The components of the machine are well made and do what they are supposed to do with ease. The materials used to make the machine have a quality feel. You will finally be able to produce the meals you could only dream about with ease and speed. The only negative is that if you hate washing up, this machine takes quote a lot of time to cleaning. If you only make special things once in a while then give the Kenwood Prospero Compact KM265 4.3 Litre Stand Mixer a go. However, if you really love to cook food, you will not be disappointed. 3, This model has a large bowl ideal for a family get together or a party. 4, The attachments are included in the price and cheaper than buying them individually. 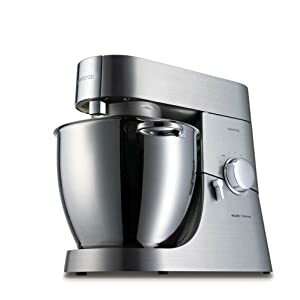 There are many mixers on the market, but if you want the real thing, the Kenwood Chef Major Titanium KM023 is the one to buy.